South of Walker Road, near the southern end of Belmont Street. Present state: Demolished - a cycleway and footpath follows the course of the Riverside branch through the site of St. Anthony's station and utilises an original skew stone bridge to the south east of the station. Notes: Although the station itself had no goods facilities in 1912 there was a siding immediately to the east serving Locke & Blackett’s white lead works. The station was on a narrow ledge overlooking the River Tyne. The main H-plan single-storey brick structure stood on the down platform. A cantilevered platform awning, embraced by the cross-wings, was probably in place until the station closed. A subway connected the platforms. Passengers deserted the station in the 1950s and with the line's lowest figures both for issue and collection of tickets, St Anthony's closed on 12 September 1960. The passenger catchment of the station was constrained by the closeness of the river and frequent buses and trolley-buses along Walker Road served . the residential area north of the station far better than the trains could. St Anthony's was demolished by 1963. 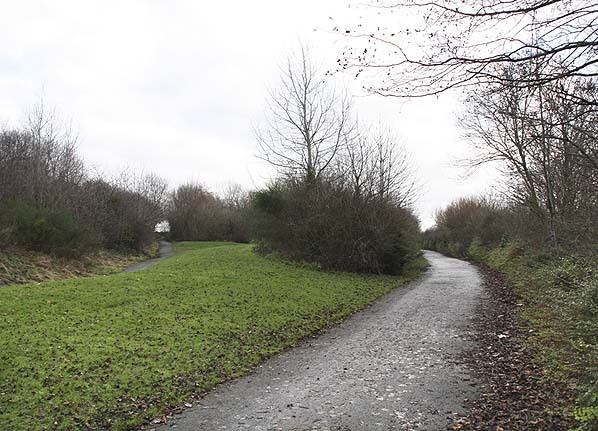 A short stretch of the trackbed through the site, including a skew-arch bridge immediately to the east, is now within Riverside Park. The 6½ -mile Riverside branch (actually a loop, rather than a branch) was authorized on 13 July 1871 from Riverside Junction, between Manors East and Heaton, to Percy Main. The branch was required because the Newcastle to North Shields line via Wallsend (most of which is incorporated into the Tyne & Wear Metro) did not serve rapidly growing communities and industries along the north bank of the River Tyne in the Walker and St Peters areas. 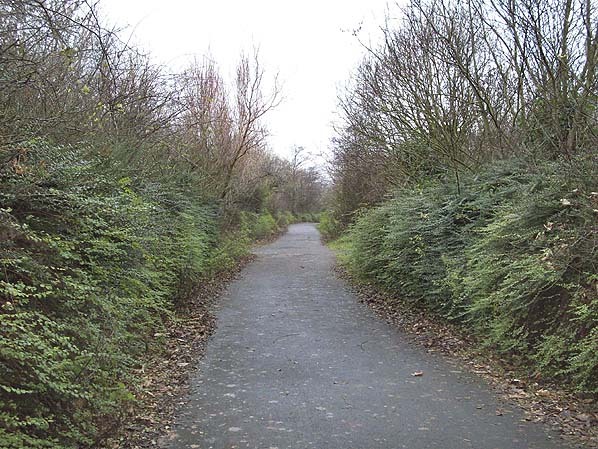 ‘The route consisted for the most part of tunnels, bridges, cuttings, retaining-walls, and embankments – an exceptionally heavy series of works’ (W.W.Tomlinson 1914) and it pursued a strikingly indirect path compared with the route via Wallsend. The Byker to Carville section followed the meandering River Tyne; the remainder ran almost parallel to the Wallsend line for two miles and for much of this distance the lines were in sight of each other. When the Riverside branch was opened by the North Eastern Railway on 1 May 1879 stations were at St Peters, St Anthony's, Low Walker (Walker from 13 May 1889), and Willington Quay. Carville opened on 1 August 1891. Byker and Point Pleasant opened for advertised passenger services on 1 March 1901 and 1 January 1902 respectively having previously been untimetabled stations for workmen. Newcastle suburban lines entered the 20th century with steam-operated services. Although street tramways had existed on Tyneside since 1879, the expansion of the system and electrification from 1901 provided strong competition to the railways. In that year Walker and Wallsend / Carville were served by the new trams, and in 1902 ten-minutely electric trams of the Tyneside Tramway began to capture traffic from Point Pleasant and Willington Quay. The approximately hourly weekday trains were no match for the trams. Between 1901 and 1903 the suburban lines north of the Tyne suffered a 40% decline in passengers carried. On the advice of C.H.Merz and W McLennan the NER resolved ‘to fight the devil with fire’ and swiftly electrified the local network using a third-rail 600v DC system. Nine months after electrification was approved, an electric train did a trial run on 27 September 1903 between Carville and Percy Main. The first regular electric service in the area began on 29 March 1903 between Newcastle (New Bridge Street) and Benton. Newcastle – Tynemouth via Riverside and via Wallsend services were inaugurated on 1 July 1904. Steam traction was retained for goods movement. The clerestory-roofed electric stock was built at the NER York Carriage Works, augmented by York-built elliptical-roofed stock introduced in 1920-22 to replace cars destroyed by fire at Walker Gate Carriage Sheds in 1918. In 1937 almost all of the earlier stock was replaced with Metro-Cammell units. These operated until 1967, when diesel multiple units took over the service. At Riverside Junction signal box, the branch left the East Coast main line and Wallsend routes, curving sharply to the right. Byker’s platforms were immediately after the junction (officially 7 chains beyond it) followed by the 140 yd Byker Tunnel under Shields Road. The line continued in a cutting with massive retaining walls at a steep 1 in 71 descent, easing off at a tight curve to the left, before St Peters (1 mile 11½ chains). From St Peters to St Anthony's (1m 65c) there was a superb view of the River Tyne, immediately to the right. The Tyne's change of direction was followed by the railway from St Anthony's, where a sharp left curve began. Travelling north-eastwards the 182 yd Walker Tunnel was followed by Walker station (2m 78¾ c). Until Carville there was an uninterrupted view of shipyards and factories to the right, with glimpses of the river and Hebburn beyond. After a series of sidings, a tight curve to the right and a level crossing came Carville (4m 33c) situated close to Wallsend Shipyard’s entrance. Passing more industries and sidings on the right, Point Pleasant (5m 9c) was entered, overshadowed by the massive walls of Wallsend Slipway. The highlight of the journey to Willington Quay was a substantial bridge over the Wallsend Burn with a fine view of the viaduct on the Wallsend route to the north. Soon, Howdon gasworks dominated the view to the left, towering above Willington Quay station (5m 54½ c). The Wallsend line came into view, and the routes converged at Percy Main West Junction. The Riverside station buildings were of limited architectural merit and more uniform than those on the Wallsend route. Each had two side-platforms. The main building at the four original stations - St Peters, St Anthony's, Walker, and Willington Quay - was a single storey H-plan brick structure, with a cantilevered platform awning embraced by the cross-wings. The buildings were designed by Benjamin Burleigh, a modified version of a style widely used by the North Eastern Railway and originated by Thomas Prosser, NER Architect from 1854-74. This ‘economy version’ of a family of station plans is described in detail by W Fawcett in A History of North Eastern Railway Architecture, Volume 2 (2003). 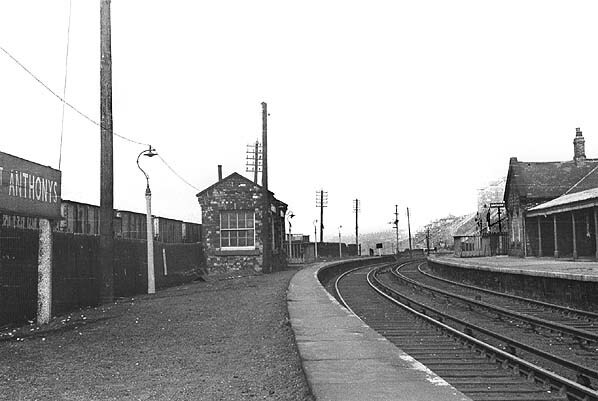 Passenger buildings at Battersby, Prudhoe and Haydon Bridge stations were the closest relatives of the original Riverside stations. Small, dignified brick shelters with a central door and two windows were provided on the other platform. Station houses of a severe, unadorned design were separate from the passenger buildings at Walker and St Peters. The later Carville had similar passenger buildings to the earlier stations, but somewhat more ambitious in design. Point Pleasant and Byker stations had simple buildings, reflecting their origin as workmen’s ‘halts’. Signage at Riverside stations in the BR era consisted of a hand-painted wooden nameboard in tangerine on each platform. Because of the line's uncertain future, vitreous enamel nameboards and later 'corporate identity' nameplates were not installed. Until shortly before closure, Walker and at Carville each had a small LNER nameplate fixed to a wall on the main building. Riverside stations were ‘staffed’, but for most of day no-one was on duty. In their final years Willington Quay’s apparently derelict building and diminutive cabins at St Peters and Point Pleasant were unlocked several minutes before trains arrived in mornings and late-afternoons and tickets were issued. The more conventional ticket issuing facilities at Carville and Walker were also staffed for these limited periods. In summer 1896 the service operated in both directions on weekdays at approximately two-hourly intervals, increasing by 1910 to hourly every day. Bradshaw of July 1938 shows an hourly service supplemented by extra trains on weekday mornings, in late-afternoon rush-hour on Mondays to Fridays, and at lunchtime on Saturdays, when shipyards closed for the weekend. One train ran each way on Sunday morning. By July 1943 several daytime services had been withdrawn, as had Sunday trains. In winter 1948-49 the Riverside service was considerably reduced, catering only for shipyard workers. Two weekday trains operated to Newcastle via Manors East - one in the morning, the other in early afternoon - and four via Percy Main - two in the morning, one at lunchtime, and one in the evening. Winter 1953-54 saw a further reduction to one weekday train to Newcastle direct, with only three in the opposite direction. The timetable effective from June 1955 provided a more generous and complex weekday service. Simplification of the timetable followed, and by summer 1958 there were only eleven Riverside train columns in the passenger timetable as against nineteen in summer 1955. However, in summer of 1961 the timetable reached new heights of complexity. The Tuesdays and Thursdays working to West Monkseaton from Newcastle via Riverside operated on evenings when late shifts were worked at the shipyards, but did not subsequently appear in the public timetables. A series of simplifications followed, and in October 1970 the service achieved its final austerity of Monday to Friday 06.58 and 16.24 down workings from Newcastle, and 06.20 and 07.45 up workings from Newcastle via Benton, with another train starting its advertised journey at 16.40 from Willington Quay. An unadvertised train operated on Tuesdays, Wednesdays, and Thursdays for shipyard overtime workers. It ran empty from Newcastle at 18.19 arriving at St Peters at 18.26, where passengers could join before its departure at 18.32. It then called at all stations to West Monkseaton before returning empty to Gosforth car sheds. After World War II, expenses were reduced by limiting trains to Monday - Saturday peak hours. Byker and St Anthony's were closed in 1954 and 1960 respectively. Further economies, shared with the main Coast Circle, involved the replacement of electric trains with diesel multiple units in 1967.
reporter's references to Point Pleasant were less than complimentary. The branch was reprieved in 1964 pending construction of a road between Hadrian Road, Wallsend, and Bewicke Road, Willington Quay. In 1971, after reviewing Tyneside's transport requirements, the PTE decided not to subsidise the Riverside branch under the Terms of the 1968 Transport Act . In mid-1972, the road linking Carville, Point Pleasant, and Willington Quay was built, and closure of the line was again recommended. On 17 April 1973 consent was given on the understanding that replacement bus licences would be obtained by 23 July 1973. It was acknowledged that a moderate amount of hardship would be caused to a small number of passengers owing to increased journey time and road congestion, especially to users of St Peters and Walker stations. Annual total costs of the Riverside service were approximately £100 000 and its earnings only £15 000. It was calculated that within one year of closure there would be a saving of £21 000. While operating economies of many lines included singling, at closure the Riverside had double track throughout its length and stations were staffed. In December 1972 the Metropolitan Railway Bill confirmed that most of the Coast Circle was to be included in a rapid light transit system but that the Riverside route would be abandoned for passenger traffic. In July 1973 only a few days separated Royal Assent to the Bill and closure of the Riverside branch. The Riverside branch had no special final train for railway enthusiasts. Instead they had to decide which train was the final one! The 16.24 from Newcastle (direct) was the last over the entire branch, whilst the 16.40 starting from Willington Quay was the last train on Riverside metals. Few people came to pay their last respects. A hand-chalked notice under the remains of the awning at Willington Quay announced the closure: 'No more waiting here after today'. 25 September 1987 and it was officially ‘taken out of use’ on 31 March 1988. Since complete closure the stations have been demolished, and some of the trackbed has been erased (as at Byker station). Between St Peters and Carville the trackbed is used as a footpath and cycling route, and at St Anthony's it is part of Walker Riverside Park. The site of St. Anthony's Station looking south east in December 2008. The path on the left was probably the entrance to the station.